Whisk together the buttermilk, dijonnaise (or mayonnaise) and vinegar in a bowl; season and stir in the chives. Trim the base of the iceberg lettuce, halve, then cut into wedges. 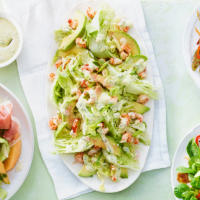 Arrange on a platter with the avocado and crayfish. Spoon over the dressing and scatter with the chopped salad onions and cayenne pepper.